I blew a tail light bulb and sought to replace it. I’ve bought them before. They’re not expensive. I went into Advance Auto Parts up on Putney Road, because it was convenient – I was already in that part of town. The clerk asked me about the car it came from, make, model, year, and then looked it up on a computer. Then he went in back and came out with two bulbs, neatly packaged in plastic. He then asked me for $ 8.90 for the bulbs. (Plus the tax –almost $10.00). I thought this was a little high, so I asked if he could sell me only one bulb. I’ve had this car for more than 10 years, and never had to replace a tail light before. I didn’t need a spare $4 bulb, so I thanked him and left. I then drove down to Sanel on Noah’s Lane, about a block down Putney. The clerk there was pretty savvy. He knew right away it was from a Benz. Went in the back and brought back 2. One was 21 watts, the other was 25. I chose the brighter one. He told me it would be 99¢. ($1.05 with the tax!). Quite a difference! Needless to say. I am not going back to Advance. 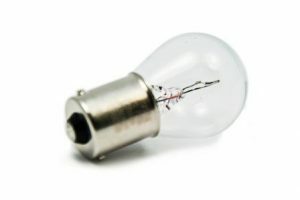 BTW, the picture is the exact bulb. An example of healthy competition.